The past few weeks have been poor for getting new images; lots of grey days and thunderstorms at various times throughout the day, there are not many birds around, and the greater Charleston area has been mostly shut down since Monday due to the threat of Hurricane Florence. 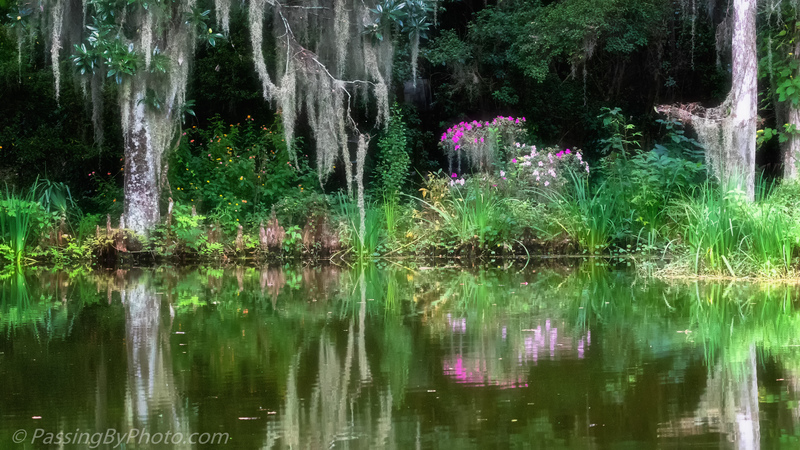 I got a quick stroll in at Magnolia Plantation and Gardens on Sunday between rain storms. The air was still so the reflections in the ponds were pretty even though there wasn’t much light. Magnolia and all of my usual haunts are closed until the storm passes. Florence’s path and power for our area are still hard to predict but I expect I’ll see some changes when we are able to return. You’re a great composer Ellen, great photo! Been thinking of you my friend and how you’ll be hunkered down. Take care you guys! Thank you, Liz, so glad that you liked it! Yes, we are tucked in and now just waiting. The wind is blowing, but not to the point of being damaging and we’ve yet to see rain. To the north of us the situation is quite different, and scary. We are-thank you so much!! I’m relieved, I hope you miss the worst of it and that your power stays on!!! Love the reflection and the touch of pink. I did not know you are in Charleston. Please stay hunkered down in a safe place. Thank you! Reflection images are among my favorites. We are in for the duration, although it looks now that the greater Charleston area is being spared the worst of it this time as NC is getting hammered. I’ve been watching the news from NC. Very upsetting. Glad you have been spared this time. Beautiful scene… I wish you all safe and secure passage throughout – and following – the storm! Thank you, glad that you liked it! Thanks also for your concern! A lovely shot Ellen. I too have been thinking of you both. Keep safe! Thank you, Belinda! The uncertainty can make you crazy. We are in for the duration and it the outlook for us is looking better. Thanks! Beautiful reflection! Hope you’re safe my dear friend. Thank you! The storm came inland much further north than first expected which is good for us, bad for NC. Wind today and we’ll likely have bands of rain tomorrow. Thanks for your concern! You’re welcome Ellen. 😊Look forward to many more amazing post on your blog.